Loop your suitcases and fly to Marrakech. The Pearl of the South concentrates all the assets of today’s Morocco. Indeed, its medina with deeply rooted traditions offers travelers a haven of peace in which you take refuge by pushing the door comforting riads. Close to the ocean and the mountains, Marrakech will satisfy the desires of the ecological tourist, sports, well-being and luxury. It goes without saying that you will return from your trip totally seduced by the oriental culture, as you had imagined it since your childhood. Here are ten good reasons to visit Marrakech, a city that smells of old stones, good food and traditions. The change of scenery is guaranteed just under three hours flight from European capitals. The planes take off several times a day from the major cities of Europe, allowing the elderly, those with a short stay free to escape, families with young children, or phobics of the plane, to travel to an exotic destination in the greatest serenity. Once arrived in Marrakech, you will find that the city is very well served and you will not encounter any difficulty to browse the area. The language barrier will not be an obstacle since Marrakechi people are fluent in many foreign languages such as French, English & Spanish. Traveling must remain a pleasure and you do not want to provide superhuman efforts to make yourself understood. You will be able to communicate easily with the locals whose hospitality is an integral part of their way of life. After doing some shopping, merchants will be happy to offer you a mint tea. And if the discussion is going well, you will be moved by the kindness and endless generosity of Moroccans since it is not uncommon to be invited for a meal to perpetuate this moment friendly. Located in southern Morocco, Marrakech is located between the Atlantic Ocean, the Sahara Desert and the Atlas Mountains. In other words, the choice of heterogeneous landscapes represents a luxury allowing you to lead the holidays in total adequacy with your requirements. The ocean offers various water activities such as surfing, windsurfing, jet skiing and scuba diving. What about sublime sandy beaches as far as the eye can see? Lovers can admire the sunset in complete privacy, walking enthusiasts feast for miles along the water, and children spend whole days playing on the sand. The desert is conducive to bivouac in the moonlight and the escapades in 4 × 4, motocross, horse or dromedary. As for the mountains, this relief represents the ideal terrain for trekking, rafting, climbing, many adventures on mountain bikes or all terrain vehicles, not to mention the winter where skiers in search of originality flee the tourists from the Alps to hit the slopes of the Atlas before joining the sweetness of Marrakech. The Pearl of the South enjoys a Mediterranean climate allowing tourists to enjoy a mild weather even in winter where it averages 18 °. During the summer season, temperatures are around 30 ° C and can rise to 40 ° C. If your morale is not at its best, you do not have to go to the other side of the world. Marrakech is indeed the ideal destination for a sun cure in the middle of December. And simply to relax for a weekend, the imperial city will invigorate you with its warmth and its many possible activities to be summer and winter. Your trip to Marrakech is an opportunity to awaken your taste buds with delicious specialties blending harmoniously flavors and cultures. Thus, the meat goes perfectly with sun-kissed fruits and vegetables. Then follow the famous oriental pastries accompanied by a sweet tea with mint. You’ll be captivated by lamb tajine with apricots, almond pigeon pastilla, tanjia marrakchia, lemon chicken tajine and many more dishes that will make your vacation unforgettable. All the cultural diversity of the Arab, Berber, European and African peoples is found in Moroccan cuisine by giving it a taste so characteristic. The succulent traditional spicy dishes have since ranked Moroccan cuisine among the best in the world. Marrakech is a cheap city. The cost of living is half the price in Europe, whether in terms of accommodation, transport, catering or leisure. Saving travelers can give free rein to their pleasures. The most fortunate tourists also have the opportunity to satisfy their most inordinate desires since the high-end restaurants and riads of exception, or the shopping sessions in the prestigious Mamounia palace, are all essential criteria to live the dream Moroccan. 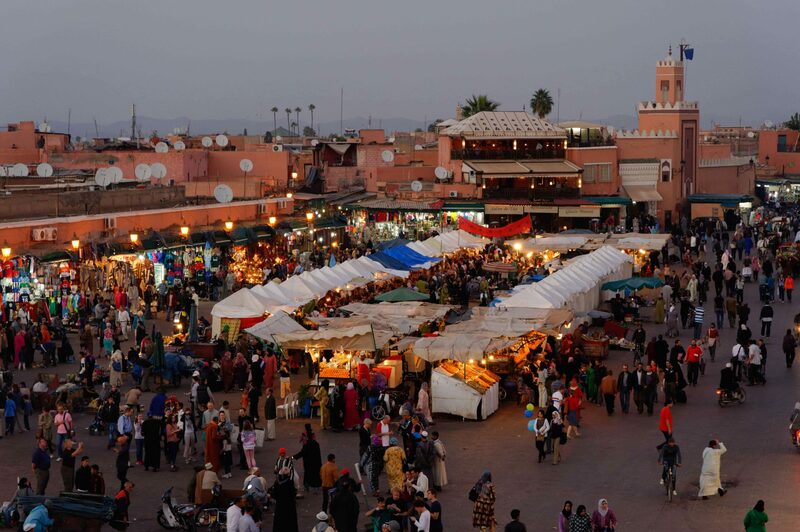 The fascinating mix of Arab, Berber and African cultures can be found in Marrakech. The Marrakechi enjoy telling you their traditions and are sure to give you a guided tour. What better way to learn the historical past of the imperial city than the authentic story of its inhabitants all very attached to their country? Founded in 1062, the Pearl of the South unveils historic sites and monuments that delight tourists eager to know. The medina contains in its ramparts innumerable riads and old houses with the traditional architecture, the Jewish quarter the mellah and the gardens of the Agdal which you will discover while losing you joyfully in the labyrinth of alleys. Arriving on the huge Jemaa el-Fna square, you will be captivated by the frenetic atmosphere caused by snake charmers, musicians, craftsmen, henna tattoo artists and tourists amazed by the beauty of the place. The Koutoubia Mosque, the Saadian Tombs, the Bahia Palace, the sublime Madrassah of Ben Youssef, the oldest university in the world Al Karaouine, as well as the lush gardens of Majorelle, El Harti and Menara are all marvels worthy of most beautiful tales of the Arabian Nights. A walk in the souks of Marrakech is the best way to immerse yourself in Moroccan life. Let yourself be guided by the scents and colors of the local products, soak up the cheerfulness floating in the stalls and admire all the objects handmade by marrakechi craftsmen working in the same way as their ancestors. The Bab El Khemis souk, located at one of the gates of the city, is particularly typical. The tradesmen spread their things on the ground and question you in order to indulge in the joys of bargaining. The souk El Kheir will also offer you a unique shopping experience, but Marrakech is full of souks, shops and workshops of all kinds that hide valuable Moroccan treasures. Party-goers are not likely to be bored in Marrakech. You can spend sleepless nights in the many discotheques very famous and ignite the dancefloor on the furious rhythms of international DJs. Bars, theaters, casinos and shows also enliven your parties, as well as private events organized in the sumptuous riads of the medina or the luxurious villas of the palm grove. It is also in Marrakech that international festivals take place, such as the Marrakech International Film Festival, attracting stars from around the world. Moroccans have unique know-how in beauty care. The countless spas installed in Marrakech lavish voluptuous massages after relaxing your body and mind in a hammam. The surroundings reveal a wonderful nature offering local treatments whose benefits have been recognized since ancient times. Thus, argan, olive, fig of barbarism are all ingredients favorable to your well-being. After all these reasons, don’t you think it is worth it to visit Marrakech?? ?